In 1995, Italian nobleman and successful businessman Giovanni Lavaggi realized his life-long dream. Through frantic fund-raising, he had found the money to buy himself into Formula One at the ripe old age of 37. Lavaggi had taken on racing as a hobby of sorts, finishing second in the 1984 Formula Panda Italia, started four times at the famous 24 Hours of Le Mans and even attempting unsuccessfully to find a career in the American CART series. Helped by the support of hit teammates in endurance racing, Lavaggi became a competent sportscar pilot, At thee 1992 Le Mans race he drove a Kremer-Porsche 962CK6 with Manuel Reuter (GER) and John Nielsen (DEN) to second in class, before taking the German Interserie title in 1993. His crowning achievement came in 1995, when he won the 24 Hours of Daytona supporting Jürgen Lässig (GER), Marco Werner (GER) and Christophe Bouchut (FRA) in a Kremer K8 Spyder. Giovanni Lavaggi on his way to the win, Daytona 1995. Though he had been performing well in sportscar racing, Formula One proved to be a massive step forwards for Giovanni. Even with the comparatively pathetic Pacific PR02, he was finding it very hard to adapt to the immense cornering forces tugging at his head, and struggled to react fast enough to keep the car under control. As former F1-driver and BBC-reporter Dr. Jonathan Palmer once put it, Lavaggi was “desperately slow“, as he never even got near the limit of the car’s performance. His frequent spins and general ineptitude behind the wheel made him a laughing stock in the paddock, where he quickly received the nickname “Johnny Carwash“, a somewhat literal translation of Giovanni Lavaggi (Washing). Worse still, Lavaggi had displaced Belgian Bertrand Gachot in his quest for glory, a seasoned driver who was once seen as a big promise. Thanks to his failure to impress, Pacific Grand Prix sacked him after four races, none of which he managed to finish. Giovanni was a stubborn type however, and started scavenging funds again to return the next year. His ploy was successful, as he broke into the Minardi team late in the season in a similar effort to his debut, displacing fellow Italian and young talent Giancarlo Fisichella. Sadly the story was nearly identical to his stint with Pacific, although he managed to hold on for six races this time around. He walked away from the sport with three failures to qualify at the German, Belgian and Japanese Grands Prix, a retirement at Monza and two races finishes in Portugal (15th) and Hungary (10th), the latter being his best result. 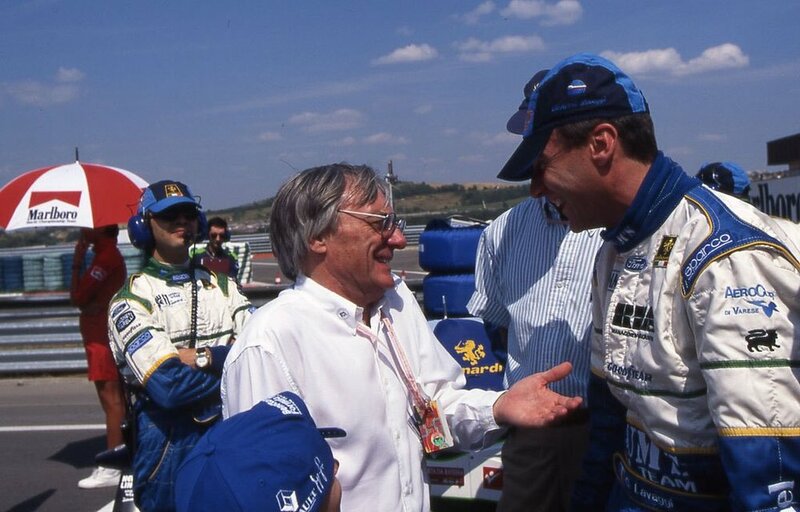 "Sorry Johnny, I'm going to have to ask you to leave..." - Bernie Ecclestone and Giovanni Lavaggi having a friendly chat, 1996. Realizing a third attempt to get a seat in F1 would be utterly ridiculous, Lavaggi decided to turn his attention back to sportscar racing. Using another big jar of money, he set up his own team, GLV Brums. Later renamed Lavaggi Sport, the outfit campaigned Ferrari 333 SP’s from 1998 to 2003, scoring two wins in the FIA Sportscar Championship, one of which was the prestigious 1000 Kilometers of Monza. After the team’s last appearance in 2003, things fell eerily silent around Lavaggi Sport. Then, completely out of the blue, Giovanni Lavaggi released a statement announcing the intention of re-entering sportscar racing in the new LMP1 category for 2006. Again several months went by without a peep out of the Lavaggi workshop, followed by a publicity shot of…Giovanni Lavaggi. Somewhere in the corner a windtunnel model of the new car could be seen, but the proud Italian couldn’t help but hog the camera. The bluntly-styled LS1 raised doubts from the paddock. Lavaggi expected the car to be ready for the start of the 2006 Le Mans Series season, but things didn’t go exactly to plan. Halfway through the season there was still no sign of the car, but Lavaggi Sport promised it would be unveiled at the third round of the season, the 1000 KM of the Nürburgring. In an effort to fuel media buzz about the car, Lavaggi placed it in a prominent position covered under a flashy red tarp, where it remained for a full day. When the cover was finally pulled off, the amassed crowd was stumped by what they saw…and not in a good way. Hastily cobbled together to make the promised deadline, the Lavaggi Sport 1 looked like at was hewn from a block of solid cheap plastic. Blunt, unsophisticated lines suggested an unrefined an shoddily-designed package. Nonetheless, the car was designed to accept a large number of engines so it could be sold to private teams more easily. The PME Ford V8 caused tremendous headaches for Lavaggi. After the disappointing reveal in Germany, the team took back to Italy to subject the LS1 to an intensive testing program. Sadly, this attempt was in vain, as the engine management system on the car’s 600 horsepower PME-prepared 6.0L Ford V8 went haywire. Unable to locate the problem, Lavaggi decided to abandon testing and replace the stricken motor. The issues meant the car had completed insufficient distance in testing to safely be race in Donington, forcing the team to miss yet another race. During this time the car was put through its paces anyway, and appeared in the paddock for the last race of the 2006 Le Mans Series, the 1000 KM of Jarama. The back of the car was seen by a dramatic number of drivers. Giovanni Lavaggi naturally took driving duties on himself, and was joined by experienced sportscar racer Xavier Pompidou (FRA). During qualifying engine gremlins struck again, leaving the car stranded in the pits. Luckily the team was granted the right to start anyway, albeit from pit lane. The frequent motor management issues were becoming a major burden on the team’s efforts, as it robbed them of valuable running time and essential data needed to improve the car. Xavier Pompidou taking the LS1 for another waddle down pit lane. At the start of the race Lavaggi immediately reported a hopelessly bad-running engine once again, and crawled his way to the pits. Scuderia Lavaggi’s mechanics frantically tried to coax the big V8 back to life, but it wouldn’t budge. In total, the LS1 would see the pit lane up close an amazing seventeen times, each time being slightly mended and sent out again only to return firing on all the wrong cylinders. After 28 laps at proverbial walking speed, the team finally threw in the towel. Mario Puglisi lighting up the track, Monza 2007. With Xavier Pompidou excusing himself from the debacle for 2007, Giovanni Lavaggi hired little-known racer Mario Puglisi (ITA) to partner him for the first round of the 2007 Le Mans Series at Monza. Qualifying proved to be another disaster for the team, as the car failed to beat GT1 cars, let alone LMP1. With a time of 1:47.160, the LS1 was 1.717 seconds slower than the fastest GT1 car, the Team Oreca Saleen S7.R. Looking back to the front, the pole time set by newly arrived factory for Peugeot and their V12 diesel 908 HDi FAP was a whopping 12.657 seconds faster. Needless to say the car failed to finish once more due to engine problems with just 57 laps in. Giovanni Lavaggi holding up the Lola B07/17 of Stefan Mücke (GER), Nürburgring 2007. The team decided to skip the second race of the season in Valencia in favor of more development work, and reappeared on the LMS stage at the Nürburgring GP-Strecke. Now backed up by Cristian Corsini (ITA), Lavaggi finally managed to beat the GT1-field in qualifying. However, they were still dead last in the prototype category, ending up behind supposedly lesser LMP2-machinery. Paced had duly improved though, as the LS1 was only nine seconds slower than the polesitting Peugeot 908 HDi FAP of Nicolas Minassian (FRA) and Marc Gené (ESP). Predictably, the car conked out on lap 29. The AER P32T promised much better reliability. The following race at Spa Francorchamps would be the last for the dreadfully buggy Ford V8, as yet another early retirement forced Lavaggi to search for an alternative. Disillusioned, the Scuderia opted to skip the final two races at Silverstone and Interlagos. A solution was found with British firm Advanced Engine Research. AER entered the LMP1 scene in 2006, hoping to take on Audi on their own terms with a bespoke 3.6L twin turbo 75 degree flatplane V8. At 650 horsepower, the unit carried a bigger punch than the lazy Ford the team had previously used. More importantly, the engine had a much better reliability record. Giovanni Lavaggi ahead of Warren Hughes' (GB) smoking Embassy WF01, Catalunya 2008. Backed by seasoned GT-racer Wolfgang Kaufmann (GER) since Spa 2007, Giovanni Lavaggi hoped the latest hire would finally stabilize his team. However, the new AER engine never delivered on its promise. Owing to the speed of development and higher budgets among rival teams, the LS1 was now in exactly the same place as before. It was far too slow for LMP1, but just fast enough to outpace GT1 cars. It seemed the concerned audience at the car’s presentation was turning out to be right. The car’s unattractive hack-job bodywork appeared to be very ineffective at massaging the air to make the LS1 fgo faster. As Audi had by now also sent a contingent to the European arm of the LMS, the Lavaggi was forced down into 28th place on the grid, some 9.735 seconds off the pace of the leading Peugeot 908 HDi FAP. Race day went as usual, with the car bogging down after 87 laps. Minor mishap for Lavaggi at La Source hairpin, Spa Francorchamps 2008. At Spa and the Nürburgring the same old broken record played, as the car retired in Belgium and wasn’t classified in Germany for failing to complete 90% of the winner’s racing distance. Thankfully though, there was a small ray of light on the dark horizon.A non-championship race at Vallelunga provided Scuderia Lavaggi with the ideal playground, as most of the big budget teams scoffed at the mere notion of competing outside of the points. 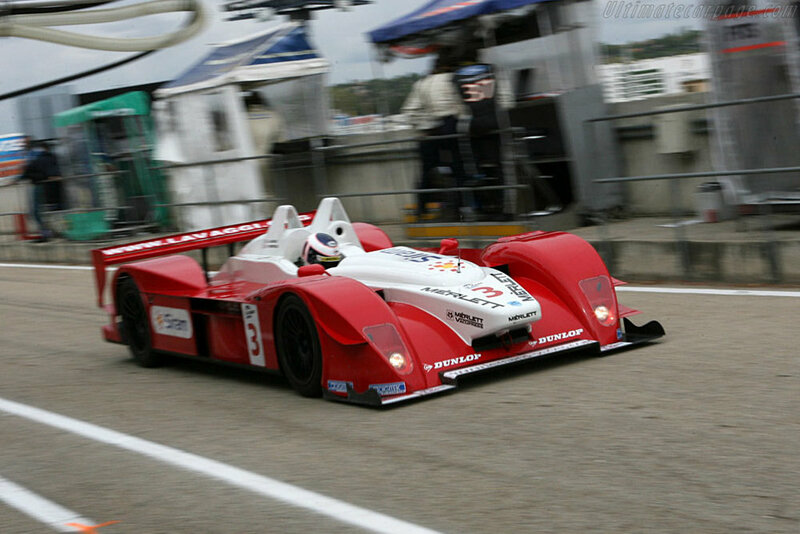 In fact, the LS1 was the only LMP1 car present, with only two small LMP2 teams for competition. Miraculously, the car stayed intact for long enough to score an unthinkable pole position. By setting a time of 1:26.776, the team had beaten the four-cylinder Audisio & Benvenuto Courage C65 by 0.635 of a second. Characteristically, the team ran into issues during the race, and eventually came in tenth. Being the only LMP1 entrant, they won the class by default. Giovanni Lavaggi and his LS1 taking their first ever checkered flag, Vallelunga 2008. Wolfgang Kaufmann elected to stay with the team for 2009, but would drive the car only two more times. Fitted with a narrower wing as per the revised regulations meant to slow the top prototypes down, the LS1 turned the triumph of Vallelunga into bitterly cold failure for the final time. The FIA-mandated raised and narrowed wing made the LS1 look even more awkward than before. After being classed as non-classified at Spa Francorchamps and recording another DNF at the Nürburgring, the immensely persistent Lavaggi finally called it quits. Fed up with the constant repairs and mountains of money being turned into complete misery. Following the German round, Giovanni Lavaggi retired his creation and abandoned top level sportscar racing altogether. The Lavaggi LS1 was an ambitious attempt at cracking a burgeoning market. Set up by one of Formula One’s most legendary rejects, Scuderia Lavaggi aimed to take down much more established names such as Lola, Courage, Zytek and even Peugeot and Audi. Sadly the car looked like something out of a bootleg lego-set, and featured an engine with the single most terrible ECU ever created. Constant electronic malaise and a chronic lack of pace tormented the car and its owner to the brink of insanity. When even an engine transplant did nothing to abet the abject horror, Giovanni Lavaggi finally put his tortured pet to sleep. Despite its devastating career, the one and only LS1 still exists in captivity, appearing at selected track days, far from the embarrassment of competition.